He does say that the amount of downloads stayed fairly constant, which means the amount of money per download (which seems a pretty good metric here) went up by an order of magnitude after he released the Pro version. It isn’t a perfect experiment though, e.g. 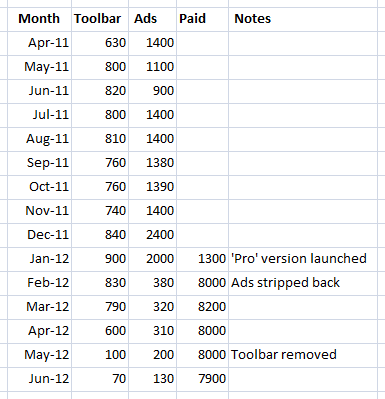 he didn’t try making money by ads or toolbars off the Pro version, which would have given better grounds for comparison. It is hard to believe he was doing 8k in sales with no advertising, no SEO. However, I guess all of the months he offered the free version could be counted as an “advertising” cost to some extent. The end result turned out good for him but it is still hard to imagine he gained that much traction in a competitive market just with a free app. Another good article, thanks Andy! Statistics like those are inspiring to me. I have been a long time reader of your blog and I hope you will permit me to ask an “off the wall” question to you. I know you live in the UK and I need to ask a simple question regarding the postal service in the UK. I live in the US and I am in the process of building a saas product. In the US we have a type of parcel postage called a “priority flat rate boxes”, which means that you can ship anything anywhere in the US for a flat rate. Boxes come in about 4-5 different sizes. Do you have something similar in the UK? You might be wondering why I’m asking you. I am thinking ahead to the day when I might expand my online business to the UK (provided the first phase is successful of course). >Do you have something similar in the UK? I’ve said it before, and I’ll say it again: Don’t write off bundling before you have tested it yourself. You’ll find many like the person above where the income is insignificant. With the right users though, that changes. I’m personally making $150,000+ a month using bundling, but it has to be done right, in the right products, for the right audience. In a technical app it will never work as well as in products for “casual” PC users. So. Test it. You may be missing out. Very interesting, thanks for sharing! Aside from the obvious conclusion, might this be a blueprint for success in a crowded consumer marketplace? 1 – Get eyeballs/traffic. By starting out with a free version, the product seems to have received much more exposure that if it was commercial from the get-go. 2 – Be responsive and build a following/identity/brand. Because the developer remained engaged and attentive, the product became loved. Its worth crept up from 0 in the minds of its consumers. 3 – Cash in. With the software’s worth established, many folks happily pay real $$ for it. I think this is a bad approach, especially if you don’t have bags of VC cash to spend. Step 1 – You can’t afford to spend any money on marketing. That is tough when you have no income. > Its worth crept up from 0 in the minds of its consumers. Actually they probably assign it little worth, because it is free. Step 3 – Your existing users are “anchored” to a price of 0 and won’t want to pay for what used to be free. Much better to charge from day 1 IMHO. All good points, thanks, but despite your objections the strategy clearly worked here. You might hypothesize it would have worked better if he charged from day one, but how can we know for sure? * So how was it possible for this person to be successful without “bags of VC cash”? Because he never needed it. Software construction costs were probably modest and an effective long-tail SEO (and Adwords) strategy wouldn’t have to break the bank. And those marketing costs would go down once he got his customers organically interacting and boosting the software’s relevance on key terms. * How did he remain responsive without an income? Perhaps he has a stable day job, extra time and lots of passion to work on his project. 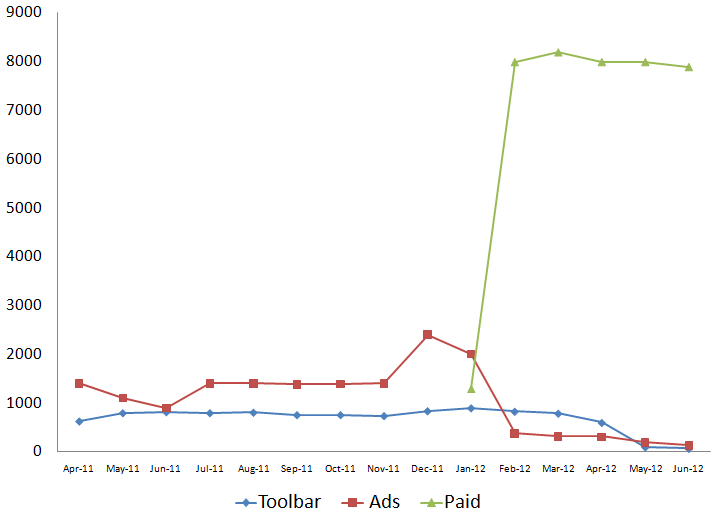 But note that his income was not 0 — he received a nice, passive stream from the ads. More than enough to keep him motivated. * And how did he create worth from a free product? It sounds like he kept his eyes open and used what he learned from his customers to add that value over time. Yes, his existing users might be “anchored” to free and it may be a challenge to get them to pay, but what about the *new* customers who don’t have that bias? They see a *trusted* product that solves their problem at a modest cost — it’s got a shot! I’m very impressed by these numbers… ! i’m wondering how much money i can earn if i decide to provide pro version of http://download.cnet.com/Right-Click-Enhancer-Portable/3000-18487_4-75451963.html.